There are a number of insurance and risk issues at play with the increased frequency of ATM ram raids over the last 12 months around Sydney. While not exclusive to Sydney, the frequency of attack has been greater than 2 per week during some periods and is unprecedented in Australia. While the ATM operators and owners of the cash face substantial losses, third parties such as property owners can face damage bills measured in the tens of thousands before considering the loss of trade during repairs. The attacks appear to be highly organised and involve significant planning, multiple vehicles and multiple people. As properties started to add bollards in the last 10 years a trend has developed for thieves to physically cut concrete bollards which along with hollow bollards take about 30 seconds to cut. Leda-Vannaclip products can delay cutting penetration by over 7 minutes, which greatly increases the chances of an unsuccessful attack. This shifted the focus of attacks to smaller lobby ATM’s such as at service stations, hotels and clubs. Essentially any branded ATM you can drive a car at. 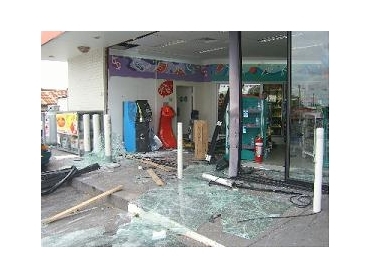 While ATM anchors that tie the bollard to a spot are beneficial, the only proven way to stop ATM thieves is with a bollard system that considers impact protection, footings and cutting resistance.